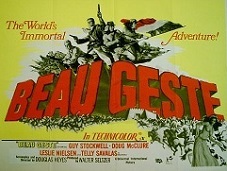 Michael "Beau" Geste (Guy Stockwell) leaves England in disgrace and joins the infamous French Foreign Legion. He is reunited with his two brothers in North Africa, where they face greater danger from their own sadistic Sergeant-Major (Telly Savalas) than from the Berbers and Tuaregs attacking the fort. Also stars Doug McClure and Leslie Nielsen. Also with Malachi Throne. This film comes from a widescreen Spanish import print.